Ours is a nation based on law. In order for justice to be dispensed we need courts, judges and attorneys. Like it or not that is how civilizations work. One of Indiana’s early attorneys and later Judge was Horace P. Biddle. Judge Biddle was born in Fairfield County, Ohio in 1811. After being admitted to the bar in Cincinnati in 1839 he moved to Logansport where he began his law practice. From 1846 to 1852, and then again from 1860 to 1872 he served as Judge of the Eighth Judicial District Circuit Court. 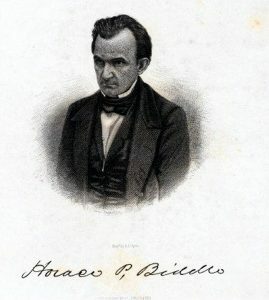 As an attorney and also while running for political office it was necessary for Biddle to travel throughout the wilds of northern Indiana. Travel in early Indiana could be a daunting and rigorous experience. The summer of 1844 was an extremely wet one. Judge Biddle was a candidate for an electoral seat in the Polk vs. Clay presidential election. Biddle was on the campaign trail in northern Indiana. While on the Rensselaer to Valparaiso leg of his journey he had to cross many of the streams and sloughs of the Kankakee Marsh. Most of the following is in Biddle’s own words as transcribed in 1877. 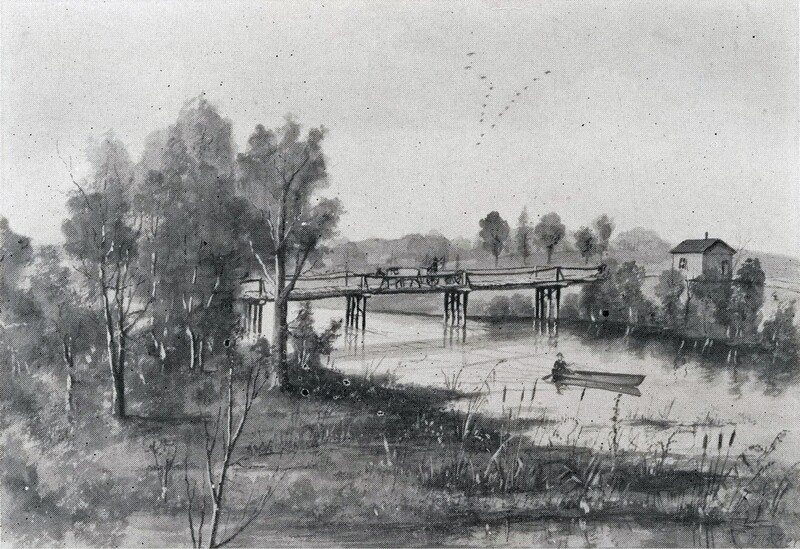 Biddle wrote: “One morning I left Rensselaer, where I had spoken the day before, to go to Valparaiso by the way of Eaton’s Bridge on the Kankakee River, formerly called on the old maps Sherwood’s Ferry. When I came to the Kankakee, I found the south bank inundated for about two miles–it all looked very dismal. The sun was half way down in the afternoon. My chances lay between remaining there without shelter until another day appeared or going on; I ventured. The water was still much the same general depth–not quite swimming–except when I crossed little bayous which I had to swim from ten to fifteen feet wide. They were numerous and no doubt had been bridged where the road crossed, but where that was it was impossible to know. Thus, I wandered about not knowing the direction exactly, but guessing at it approximately by the sun which was fast sinking towards night. At length I got a glimpse of the bridge through the trees; the south end of which seemed to rest upon the water. It was a tall bridge with a pole across it, locked down…with a cabin hard by on the opposite bank, but to all appearances, no one in it. I hallooed and hooted until I was tired and hoarse. My horse could neither jump the pole not crawl under it. Finally, I saw a man running towards us from a distant field, and when he arrived, he was as pale as ashes. After raising the barrier, he inquired how on earth I came there. After reaching safety I felt rather good humored. I assured him I did not come “on earth” at all–that I had come by water. He expressed great surprise and assured me that no one had passed that way for two months before. It was thought to be impassable at the time.” After resting, Biddle continued his journey to Valparaiso. 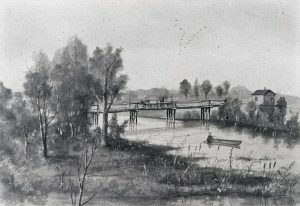 The location Biddle crossed is now named Baum’s Bridge. Judge Biddle passed away on May 13, 1900 at his Wabash River island home in Logansport, Indiana.